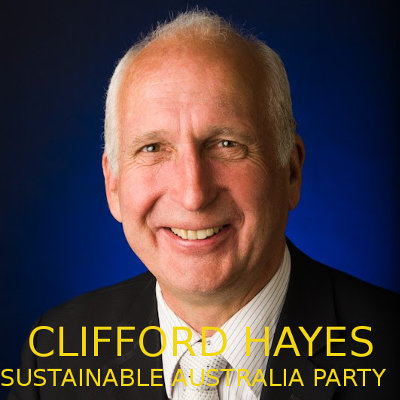 Sustainable Australia Party's Southern Metropolitan region Upper House candidate Clifford Hayes appears to be elected to the Victorian Upper House, according to various media reports. For those of you reeling at the thought of a Labor Government, second time round, with the bit between its teeth on immigration, land-clearing and the scent of developer money in its nostrils, this news of a win by SAP, may give some hope. We need more SAPs in government, as fast as possible. A weight of 15,000 votes (from 148,000 ballot papers) actually comes from the overflow of successful Labor and Liberal candidates. This amounts to 35% of Cliff's vote count and is due solely to the way the two Major's preferenced him - not micros. Just saying this as it might help counter any complaints there might be about preferencing. The difference in 'votes' vs 'ballot papers' in the above counts is of course because overflow ballot papers are reduced in weight each time they have already served to elect someone. Here reduced 90% in weight on average by the time Cliff got them. Looking at the Group Tickets: Labour preferences for SAParty started at 12th of 45 candidates, Liberal at 22 of 45. ( Greens had us at 14 of 45). These are all pretty good for us. Anyone using above the line voting for these majors dictated their preferences would go according to these Major's tickets (not SAParty's of course). Some quotes from Clifford Hayes' speech: "We residents must have a say. The whole process has been corrupted." "It's a problem of culture: developers and planners sing from the same songbook. More housing, more consolidation, more appartments, more units, more highrise - all on existing infrastructure. And this forces the price of land and existing housing up. Bad news for our kids, bad news for our suburbs, bad news for us. Good news for investors, good for speculators, dramatic profits to be made. So this pressure makes property speculation and property development a government protected industry. And it's backed up by planners, VCAT, the government, the department: The whole problem has been left to market forces to sort out. This is great for people who see housing as a way for people to make profits, but for a community it's bad news. We lose all the things we value. As communities we need to get things right. Housing should be for families, not just for investors." Today the Victorian Electoral Commission confirmed that our Southern Metropolitan Upper House candidate Clifford Hayes was elected to the Victorian Parliament. Read The Age article here. I offered my personal congratulations and thanks to Clifford, who first stood for the party as a Senate candidate in the 2013 federal election. Five years later he's proud to be our first elected Member of Parliament! You may wish to leave a message of congratulations here on Facebook. It was a huge team effort. Thank you to everyone involved - including our National and Victorian committees, 27 Victorian candidates and many members and volunteers! There have also been many people right across Australia that have helped (and stuck by) us over the years on this challenging journey. I hope this gives you great satisfaction and new hope. We now need our NSW members and supporters to help us to double up! If you live in NSW, stay tuned for information on how you can get involved. Hooray! Many congratulations to Clifford and all at SAP. The following are the number/s of seats per party in the Upper House of the Victorian Parliament - ALP- 18, Lib/ Nat-10/1, Green -1, Derryn Hinch's Justice Party - 3, Shooters, Fishers and Farmers -1,Liberal Democrats-2, Animal Justice Party -1, Fiona Patten's Reason Party-1, Sustainable Australia Party- 1, Transport Matters Party -1. It will be interesting to note when the name of the party is mentioned on the television MSM. So far I have not heard it named. I heard on the ABC radio news at 11.00a.m today that Kelvin Thomson, former ALP Federal MP has resigned from the Labor party, joined Sustainable Australia Party and will be an advisor to Clifford Hayes, newly elected to the Victorian Parliament Upper House. This would seem to be a great combination of wisdom and political expertise. The election of a SAP candidate to the Upper House, and Kelvin's decision to resign from the ALP and put his shoulder to helping Clifford Hayes gives us some reason to hope for a break in Australia's bipartisan and undemocratic growthist policy. The tension grows, however, because as people begin to act politically against this, (and I include non-ecological reactions such as P. Hanson's party) the size of the population develops its own inertia. The greatest harm to Australians comes from politicians and demographers who utterly avoid admitting that they have no plans at all for stopping growth beyond their short term projections. A new democracy would imprison politicians and demographers who have allowed their words to be used to condemn us to loss of self-determination via loss of control over our numbers.